The high quality, sturdy Waltons Evesham Wooden Greenhouse provides a large space to grow your plants all year round. Backed by a 10 year anti-rot guarantee, you can be sure this building will last for years. 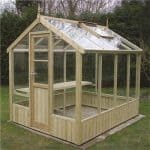 Its attractive wooden design is different to the majority of greenhouses on the market. The wooden panels are created from 12mm Shiplap cladding which is known for its outstanding weather resistant benefits. It isn’t just the wooden panels that have been built to an exceptional standard. The glazing is also pretty impressive boasting both shatterproof and UV protective qualities. The apex roof adds excellent height to the building, making it not just comfortable to manoeuvre around, but also allowing you to grow taller plants and flowers. An integrated roof vent allows you to regulate the temperature within the greenhouse. A single half panelled door is included in the design, providing great access to get wheelbarrows and tools in and out of the building. A butterfly catch has been added to the door so that it won’t blow open. 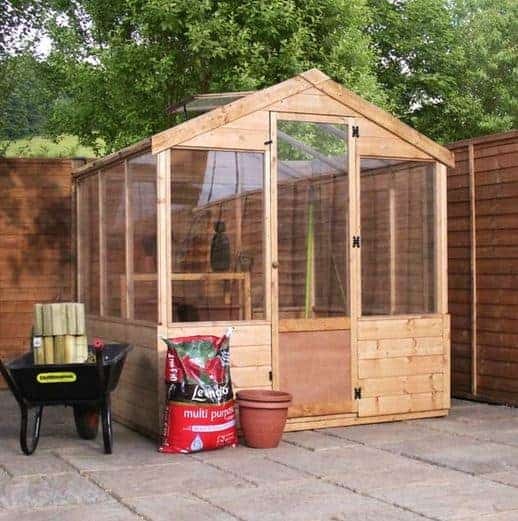 However, this doesn’t provide any security to the building so you will need to make your own improvements if you need the greenhouse to be secure. Whether you are a budding gardener or you are just starting out, this really is a fantastic choice. There is no floor so it does need to be built on a very firm and even base. 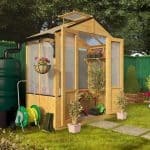 This is a medium sized wooden greenhouse designed with both the beginner and expert gardener in mind. It benefits from a tall height, ensuring you can grow large climbing plants, as well as store taller tools with ease. The door’s width is a little on the short side compared to most buildings of its size. So you would find it difficult to manoeuvre a wheelbarrow in and out of the greenhouse for example. This needs to be kept in mind when trying to decide whether this is the right model for your garden. 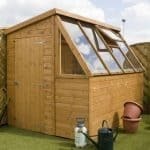 The impressive height of this greenhouse is thanks to the sharp apex roof which offers not just more interior height, but also great rot protection. Rain slides off the roof before it has chance to build up and potentially soak through to the timber. Like the walls, the roof is also glazed so that light enters through into the greenhouse at all angles. There isn’t a floor included with this building so you do need to make sure that you have a solid, concrete base available. The plus side of it being floorless is that you can store heavyweight equipment and items such as large bags of compost without worrying about it collapsing under the strain. This greenhouse is unusual in the fact that it features a half glazed, half wooden design. The wooden part of the building is constructed from 12mm Shiplap tongue and groove cladding. Basically the highest quality cladding you can invest in, Shiplap offers wonderful weather resistant benefits. It also gives a very smooth finish and looks a lot more attractive than overlap. As it is also thicker than overlap, it is a lot more durable and will last for many years; particularly if treated regularly. Slightly different framing 27mm x 45mm measurements are used on this model, giving it a more rigid level of support. 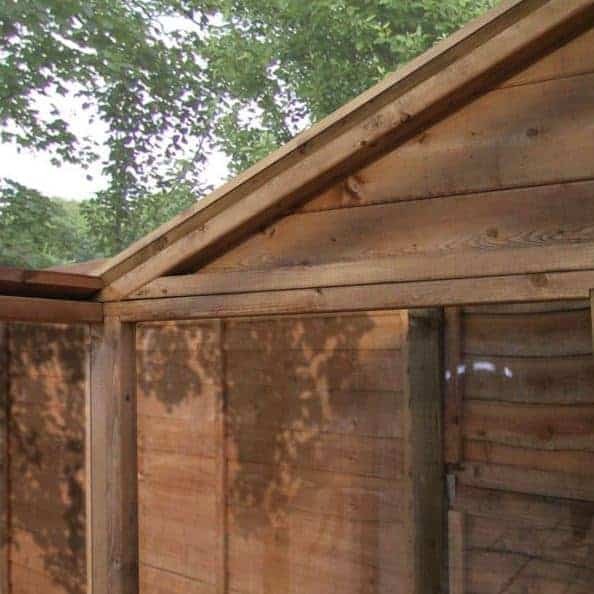 As half of the greenhouse is created from Shiplap cladding, it does require annual treatments. 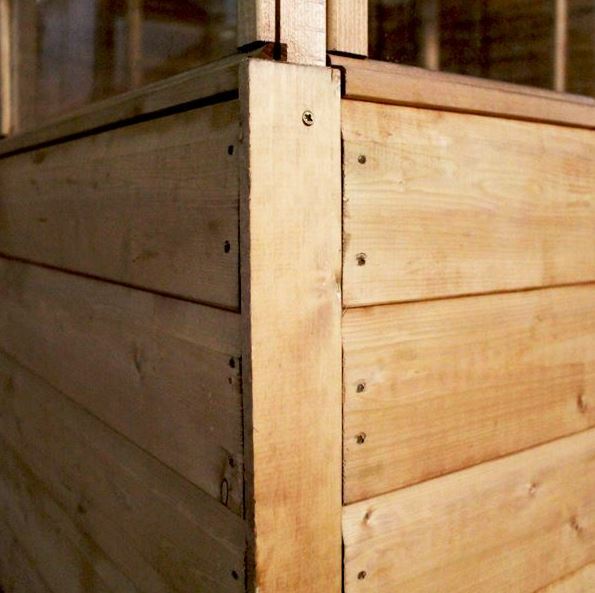 Prior to being shipped, the timber is dip treated in order to protect it whilst in transit. However, Waltons do say that in order to qualify for the great 10 year anti rot guarantee, a further high quality treatment will need to be applied after installation. A single door with a turn button catch is included, though as you can see from the picture, it is a little thinner than standard greenhouse doors. This won’t be a problem unless you’re hoping to be able to get a wheelbarrow or other large piece of equipment in or out of the building. It has a unique small knob handle which adds to its unique design. The turn button catch will successfully prevent the doors from opening on their own accord when the building isn’t in use. This is a very important feature for a greenhouse as you obviously need to control the temperature inside and the doors blowing open, letting in cold air could threaten the life of your plants. Most of the greenhouse is glazed, including the roof. Shatterproof styrene glazing has been used to ensure it is both difficult to break and safer if it does. The glass has also been UV treated so there’s no risk of it getting damaged in the harsh sun. Security isn’t really something that manufacturers tend to focus on with greenhouses. This is because generally most thieves aren’t looking to steal plants. However, this will be a problem if you’re hoping to store valuable gardening equipment in the building. If you are, we highly recommend adding some form of security such as a pad bolt and padlock or an alarm system. There are three great extras and customisation options available. Firstly there’s the installation service. This basically eliminates the stress of trying to assemble the building yourself. It doesn’t include the installation of a base, but everything else is taken care of for you. The professional team even clean up after themselves. This is the most expensive extra but it is worth the money if you can afford it. If the plants you are growing require a lot of heat in the colder months, the Lifestyle Greenhouse Gas Heater is essential. It provides a safe heat source for your plants all year round. The 1.9kw heater is also economic and won’t cost a lot to run. Whilst the greenhouse does come with an integrated vent, it is worth considering upgrading to the Greenhouse Auto Vent. It comes at a really low cost and can be installed in just a matter of seconds. You can set it to open at specific temperatures, allowing you to fully control the internal temperature of the building. It has been constructed to be corrosion resistant and it can open up to an impressive 14 inches. This is a very high quality greenhouse. Both the wooden and the glazing sections have been constructed from strong, durable materials. It also has a very stylish appearance compared to a lot of other models on the market. As the building is split between a wooden and glazed design, it benefits from exceptional longevity. 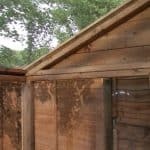 The glazing requires no maintenance, but the wooden Shiplap panels will need to be annually treated. 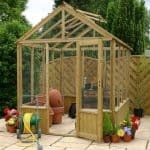 This is a medium greenhouse and it offers a great amount of space that will suit the amateur and more experienced gardener. It should fit into most gardens and its height makes it possible to grow taller, climbing plants. This is fairly straightforward to put together, but we would advise leaving an afternoon free to assemble it. All instructions are provided and the roof is the only thing you may struggle with due to the height of the greenhouse. This long lasting greenhouse offers substantial value for money. It is going to last for years and it benefits from a more stylish design than most other models. 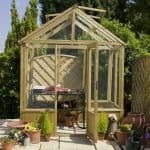 Final Thoughts: If you’re looking for a greenhouse with a difference, the Waltons Evesham Wooden Greenhouse is ideal. Featuring a half panelled design, this medium size building gives you plenty of space to grow all kinds of plants and flowers. Every aspect of its design has been constructed with exceptional quality in mind. The Shiplap wooden panels are strong, weather resistant and offer a more stylish design. The shatterproof glazing also makes this a fantastic choice for family homes where safety is paramount. It is also UV protected so the sun’s rays will not damage the structure over time. A few things could be added to make this slightly better, but overall it is a high quality greenhouse that will last many years.